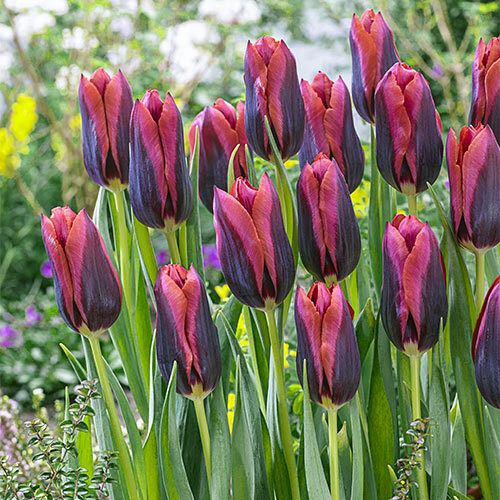 For a drama-filled display in the border or bed, consider a generous planting of this uniquely hued tulip. Slawa sports a luxuriant burgundy-red coat painted with a rich black flame down the middle of each supple petal. Vivid orange edges bleed into the red for a dynamic color palette that looks amazing when planted en masse. As blooms mature, the black fades but the unusual beauty remains. Perfect for container gardens, cut-flower arrangements and sunny borders, this is a head-turning variety with style to spare. Easy to grow and maintain. Requires only well-drained soil and regular watering. Let foliage die down naturally. 5" flowers are long and slender with a pointed tip.